Atabey is the goddess of the Earth Spirit and the spirit of horizontal waters. She was worshipped by the Pre-Columbian Taino natives that inhabited the Caribbean islands of Antilles. A Primary Supreme being representing the four cardinal points. Unique Turtle women of fertility, beauty, rituals, music, and ceremonies; mother of twins Yúcahu (God of Yuca/ the sea and the mountains) and Juracán ( God of Hurricanes). 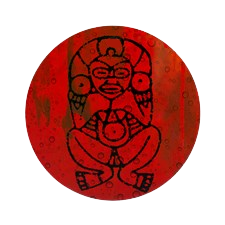 She who gave birth to herself from all the elements, celestial Earth Mother Goddess of five names, Momona / Moon, Guacarapita / Infinite, Iella/ Omnipotent, Guabancex / thunder and lightning, Guimazoa / invisible energy moving the waters and tides. She manifests in multiple aspects primarily as the loving mother but also the spirit of love and the wild mother of storms and natural disasters. She is most commonly depicted in the birthing position, representing a nurturing maternal figure. 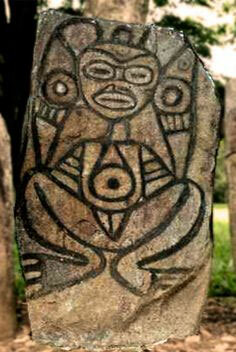 Taino women would call upon her to watch over them during childbirth. Atabey resembles the Coqui frogs of the Virgin Islands which were held sacred by the Tainos. There is not much known about this ancient goddess of the Caribbean; after a brief period of coexistence the relations between the new-comers and natives deteriorated as the Tainos were removed from villages and sold into slavery, starved and died of european diseases and suffered greatly under the oppression of the Spainiards searching for the New World. Even though much information has been lost, the spirit of Atabey and her beloved people lives on through tradition passed down through the generations.